There is not a customer service business in the world which has not been left with a furrowed brow when trying to meet the challenge of keeping the regulars and new customers happy in the face of competition. As we continually introduce new technologies into our business, we sometimes neglect the number one marketing channel – customer service. Attracting and retaining customers is a continuous battle that changes daily and just when you think you have the answer, another problem arises. It is imperative businesses set goals and standards for staff to achieve. Here are 10 key items to consider when setting your goals for customer retention. 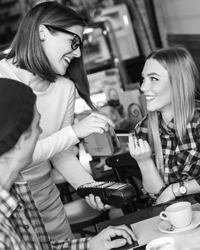 Always keep the customer at the heart of everything you do – It’s not just thinking about your bottom line and how you can generate the most revenue, otherwise you will end up sucking the life-force out of a lot of customers who will not want to come back. Making sure a customer is happy is always number one – the money comes after. Keep looking outside the window – Be engrossed in not only what you offer, but also what everyone around you is offering at the same time. Understand at least one of your key competitors has a large share of your wallet. Analyse the contributing factors, reflect on it at the end of the month, and see how you can use that research to your advantage. It’s not about replication, but understanding how players interact and what they come to expect. Volume vs Value – Volume will come through many components of your business such as food, beverage, functions and entertainment. Once volume has been achieved, it is important to understand and prioritise the value of your players and how to convert through other areas. Remember, at the end of the day, you and your staff are all ‘salespeople’ that need to identify and sell each component of your product. Make sure there’s clear and tangible targets for growth set around everything you do – Just because you’ve always done something isn’t a reason to keep doing it, especially in an industry that moves as fast as ours. Yes, look after the pennies and the pounds will look after themselves, but make sure you understand each component of the business and what value it represents – or more importantly what value should be achieved. Content is king – This incorporates all aspects of the business. Just as it is important for gaming to have the most up-to-date and popular games, it is just as important to ensure you are serving the latest trends in food and beverage dishes. In an industry saturated by choice, venues must strive to ensure all products are current and in-line with the expectations of the consumer. Right to win – Ensure you have the right to win with what you show your customers. If it’s ‘good enough’, and ‘its always been like that’, then it isn’t good enough anymore. In a world where your competitors are becoming more savvy in understanding their customers and you have the data to stop them in their tracks, it just doesn’t make sense to take your customers for granted. Instead, make the effort to find out their current favourite game, how much they like to spend per session, what they like to eat/drink and targeting the different content and value propositions that you send them based on the information at hand. Keep it simple – Just because your team has years and years of experience, you can’t expect your customers to appreciate this. We spend numerous hours each week analysing and forecasting our business, but that’s not what the customer wants to hear. They want to hear about their chance to win and what they need to do to qualify for a promotion. It’s about keeping it really simple and approaching your customers in a manner they will understand. Once they become confused, it is twice as hard to engage. Just because you understand the process, it doesn’t mean your customer will. Put yourself in their shoes to find out if a process will truly make sense and achieve the result you’re aiming for. Launch and leverage, share and re-apply – Seek to continually optimise and streamline what you’re doing. It’s not just about getting the promotion/activity live, it’s also vital to add value in your team and making sure you have the optimal processes. It’s not only being reactive but also making sure that it works around the clock. Win as a team and celebrate success – The key to running a successful promotion and beating your competitors, is making sure that everyone is striving towards the same goal. Make sure that your team understands what you’re trying to achieve, and always follow up with a moment to thank your team and celebrate success. Have fun – When you look across the day-to-day and long-term plans for running a venue, sometimes approaching it with flexible, general outline leads us to coming up with our best ideas. Some things are about the journey, some about the destination. While it’s important to keep the end game in mind, if you get your head stuck in budgets, logistics etc. you may miss out on the experience the journey gives you.